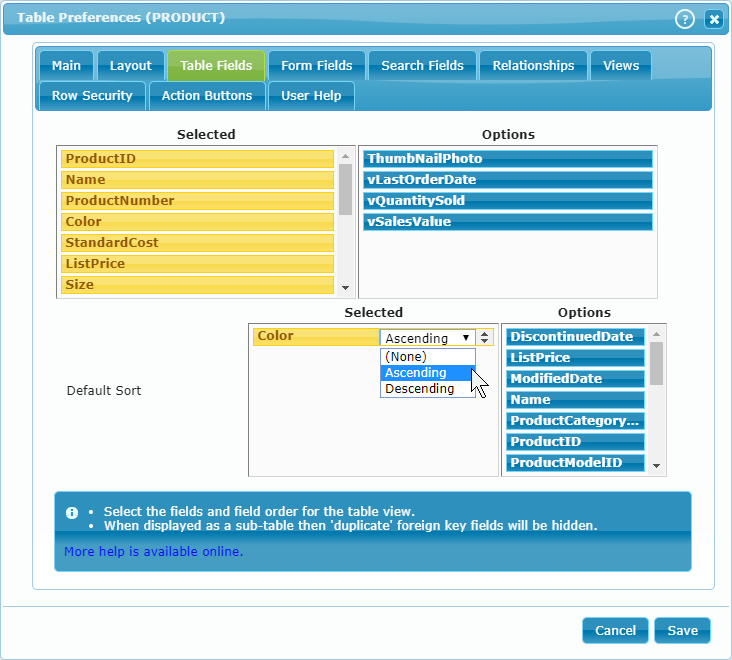 The Table Preferences is where you setup how the table will appear including the fields that will be available in the grid and details pane. You can view the latter part of the video Adventure Works in 5 Minutes to see a walkthough of the Table Preferences. To access the Table Preferences you would click on the gear icon next to the table name in the details tab. You can see the details tab in the image to the right. The main preferences allow you to set the table caption, caption fields and its role. Caption: The Display name of the table as seen in the menu and other places. Type: Allows you to change how this table is accessed and used. 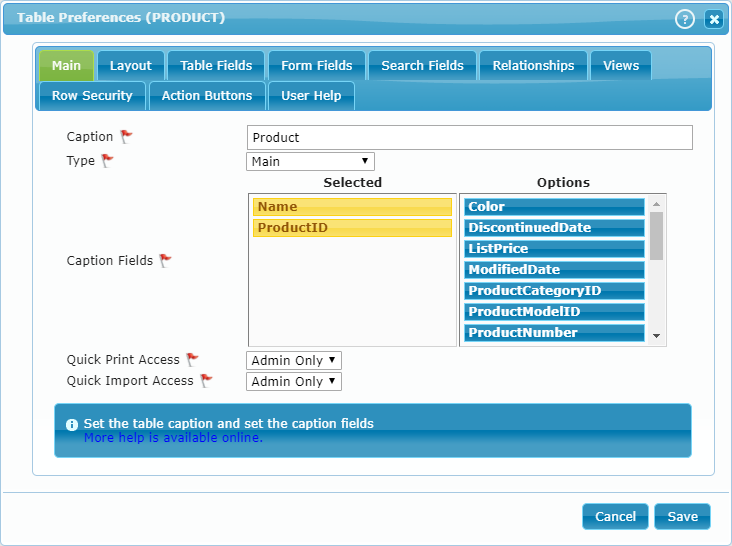 For more details see the Manage Tables section of the page: Database Preferences. Caption Fields: The fields that are used to name the current row. In the example we chose the Lastname and Firstname columns. You can see this in action in the full page image at the top of the screen. Quick Print Access: Allow Admin or all users to create and run their own Quick Reports. Quick Import Access: Allow Admin or all users to perform a Quick Import. The Layout tab is used to specify how you want the form to be arranged. Table Over Tabs - Default View, the Table will take up the full width of the screen. Table Beside Detail - Attempt to place the Table and Form beside each other. Css Class: CSS class to assign to the form. That allows futher layout customization via CSS. Min Width: Minimum Table width in pixels, determines if the Form should be pushed below the Table. Default Rows: Default number of rows to display. It is not unusual to set this to 1. Min Width: Minimum Form width in pixels, determines if the Form should be pushed below the Table. Max Columns: Maximum field columns. (Ignored is some browsers). Min Width: Minimum amount of space to leave each column in Pixels. Label Position: Default placement of the fields label, [Left, Right, Top, Inline, None]. Can be overridden at the field level. 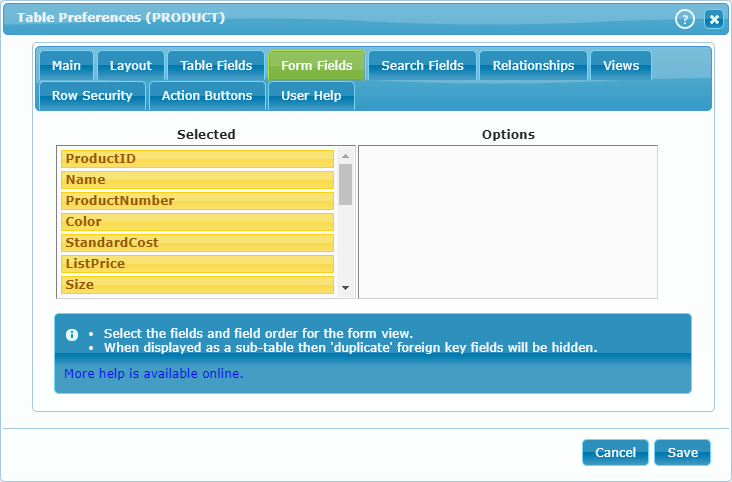 The Tables Fields tab is where you select and arrange the columns that appear in the table at the top of the screen. If a column points to a lookup table then the lookup value will be used. The fields used from the lookup table are determined by adjusting that fields lookup columns in the Field Preferences. Default Sort: This sets the initial sort order of the table. The Form Fields tab is similar to the Table Fields tab but it is used to add, remove or rearrange the fields that will be visible in the details pane. dbFront will use the field list along with what it knows about the screen space available to make a display that is as useful as possible. 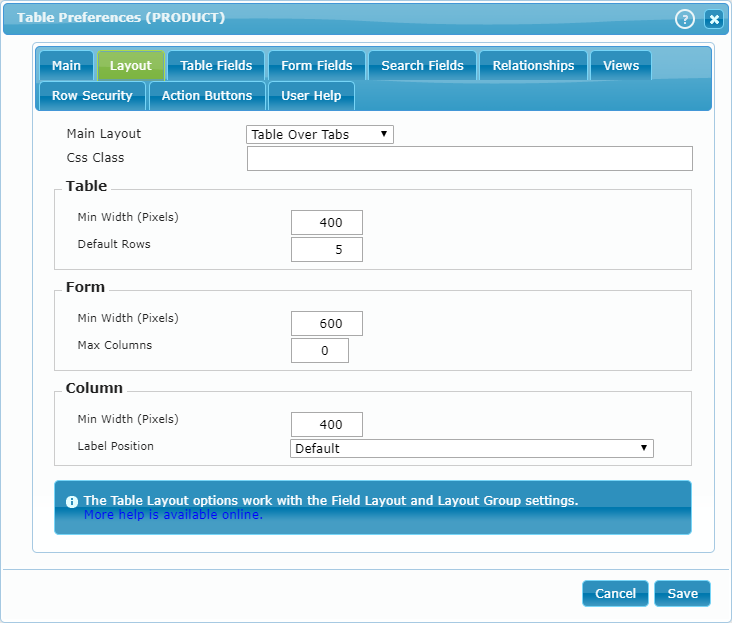 Once you save the table preferences then you can open the Field Preferences for the displayed fields to further adjust how the fields appear and interact with the user. The Search Fields tab is where you specify what fields a user can use for Advanced Searches. 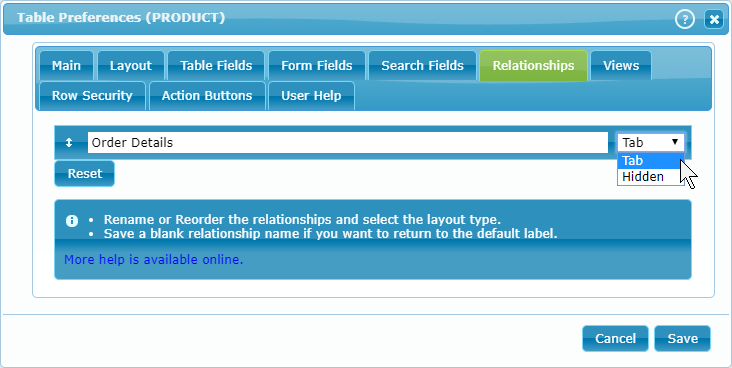 The Relationships tab is where you can rename, reorder or hide specific table relationships. The Table Vies tab allows for the ability to add one or more views to a table. 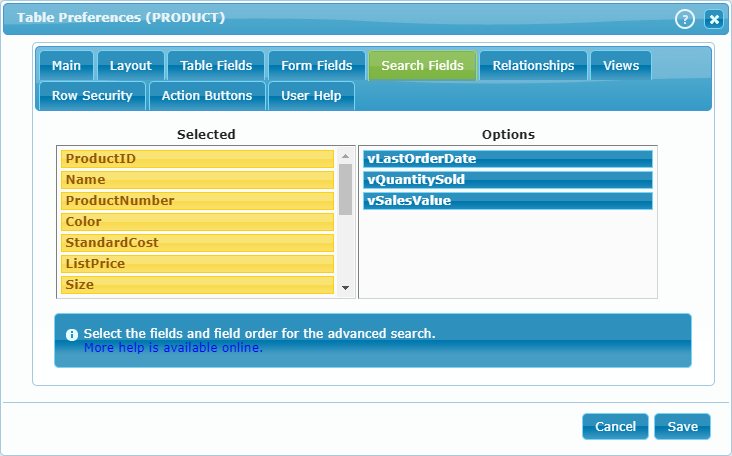 The purpose of table views is to make extra column information available.. For more details see Table Views. The Row Security tab is used to manage user access to the individual table rows. For more details see Row Security. The tab named Action Buttons is used to add, delete, rename or rearrange the action buttons assigned to this table. dbFront support the ability to setup Table level help. In the future we will also be adding the ability to add field level help. The help appears when the Sidebar Help is visible.